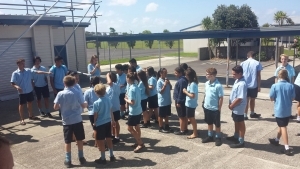 Here at Ruawai College we are proud to call ourselves a PB4L school, which stands for Positive Behaviour For Learning. It is a school wide programme designed to build a culture where positive behaviour and learning is a way of life. It aims to minimise problem behaviours and celebrate positive social and academic behaviours. We are at present in Tier 1 of the programme, having consulted with students and the community and decided on our core values and behaviour expectations. We are focussing on embedding these values and behaviour expectations throughout the school, at all times and in all places in two ways. Firstly, we have a house competition, with a reward for the winning house each term and the awarding of the virtues trophy to the overall winning house at the end of the year. Secondly, each fortnight we set one of the criteria as a focus and students can gain individual blue kumara awards, which go into a fortnightly draw. The purpose of PB4L is to change the environment, systems and practices we have in place to support our students to make positive behaviour choices. We welcome feedback from students, staff, parents, whanau and the wider community.